The cornerstone of our business is people over process. Processes can be designed, developed and implemented, yet none of this takes place without people. The individual is at the heart of our business consciousness. Our tag line says it all – we want you, our clients and the people who support your business, to be the best that they can be, to be really great. Business Results Group (BRG) is a niche consulting company that is home to some of the world’s greatest thought leaders. By applying world renowned content we design and deliver solutions to corporate Africa, enabling organizations to build people capabilities and drive business results. We have more than 18 years of experience in the field of leadership, strategy and innovation and have been fortunate to have worked with many of South Africa’s leading organisations. BRG facilitates greatness by identifying, sourcing and delivering the world’s best thinkers, learning solutions and development models to support our clients in becoming the best that they can be. We partner with clients to find practical solutions, that allow the integration and alignment of three key areas of business – people, strategy and innovation – in such a way that it brings tangible business results. We strive to demonstrate a real ROI on our interventions, linking investment to a measurable return in the business and the achievement of the goals and ambitions of our clients. 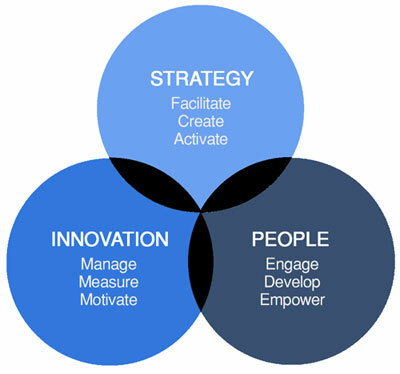 BRG delivers a range of solutions to business from strategy facilitation to leadership development. Business Result Group (BRG) was started in 1997 by Nicola Tyler, who, having worked internationally with Dr Edward de Bono, established a training company to take De Bono’s work into Africa. With a successful track record in thinking, the company branched out into facilitating strategy workshops with a specific focus on innovation. The tools and models designed over the years are now taught in many of South Africa’s top organisations. Seeing a need to expose South Africa’s business leaders to world class thought leaders, in 2010 the company introduced an Events Division which gave birth to the BRG Progress Conference, and the BRG Masterclass and Seminar series. In just a few years BRG’s Events division has grown in leaps and bounds, and has attracted more than 4,000 business leaders. In the words of one client “I don’t need an international trip to attend a conference, BRG brings international to me”. The Events division brings thought leaders to Africa, thereby enabling cost effective access to some of the world’s best business thinking, ranging from Neuroscience & Leadership to HR Strategy and Execution. Today, with more than 18 years experience under our belt, BRG boasts an enviable client list as well as being the partner of choice for some of the world’s best thought leaders in business.